Patients with epigastric pain, postprandial fullness, bloating and regurgitation may have gastroparesis. Similar symptoms may be caused by oesophageal motility disorder. Abnormal oesophageal acid exposure may also play a role. Patients with symptoms suggestive of gastric neuromuscular dysfunction have a high prevalenceof oesophageal dysmotility. Oesophageal dysmotility occurs irrespective of the degree of gastric emptying delay. There is no relationship between oesophageal symptoms and motor or oesophageal pH abnormalities. High resolution oesophageal manometry should be considered in patients with epigastric pain and postprandial distress syndromes. If found to be present in such patients, oesophageal dysmotility may contribute to symptoms. Concomitant therapy for both gastric and oesophageal dysfunction may improve outcomes. The aim of this study was to examine whether patients with gastric neuromuscular dysfunction, such as epigastric pain and postprandial distress syndrome suggestive of FD and delayed gastric emptying, also have concomitant oesophageal motility abnormalities and, if so, whether there are any associations between these disturbances. We hypothesised that patients with scintigraphic evidence of GP would have a high probability of oesophageal dysmotility, possibly contributing—at least in part—to their upper digestive symptoms and their resistance to gastric-directed therapies. Patients: This retrospective cohort study was approved by the Institutional Research Board of El Camino Hospital and was conducted at the Neurogastroenterology and Motility Center of Silicon Valley Gastroenterology, in Mountain View, California. The study was considered exempt from the need for individual informed consent from participating patients, since it was a retrospective review of data collected for clinical, standard of practice, purposes. Nevertheless, patients consented for the various studies (scintigraphy, high resolution manometry (HRM) and pH, among others). Patients were recruited through a review of the electronic medical records, using International Classification of Diseases (ICD-10) code K31.84 for gastroparesis and K30 for functional dyspepsia. Inclusion criteria: On presentation, all patients were symptomatic with upper abdominal complaints that were recorded on questioning and formal questionnaire-based assessment. To meet entry criteria, patients had to have one or more upper abdominal symptoms suggestive of gastric neuromuscular dysfunction (gastroparesis or functional dyspepsia), such as epigastric pain, postprandial bloating, nausea, vomiting, of at least a 2-month duration, a scintigraphic gastric emptying study and no gastric outlet obstruction by endoscopy. Further, they had to have undergone a high-resolution oesophageal manometry and ambulatory pH monitoring. A detailed initial history and physical was conducted to exclude any other plausible explanation for the patients’ symptoms, and additional tests (eg, biopsies, biliary imaging, and contrast studies) were ordered as indicated for diagnosis (see study flow in figure 1). Exclusion criteria: Patients <18 years, those with known obstructive oesophageal or gastric disease by endoscopy, those with systemic illnesses, such as scleroderma, or neurological conditions, such as Parkinson’s disease. On presentation and during evaluation, none of the patients were receiving medication affecting gastric motility. Of note, the study, although community-based, was on a referral population to a gastroenterology practice with emphasis on motility disorders. Study flow outline. Ultimately, all studied patients had undergone gastric scintigraphy (44 with delayed GE and 17 with normal GE), HRM and oesophageal pH monitoring. GE, gastric emptying. High-resolution oesophageal manometry: A solid-state HRM catheter with 4.2-mm outer diameter with 36 circumferential sensors located at 1-cm intervals was used for the study (Medtronic, Sunnyvale, California, USA). Manometric studies were performed with patients after at least a 6-hour fast. The HRM catheter was placed transnasally and positioned to record from the hypopharynx to the stomach. The manometric protocol included baseline recording and ten 5-mL water/saline swallows. The high-resolution oesophageal pressure topography of each swallow was analysed for integrity of the 20-mm Hg isobaric contour (IBC). The length of the break within 20-mm Hg IBC was measured using the smart mouse tool in ManoView software (Medtronic, Sunnyvale, California, USA). Oesophageal peristalsis was defined as intact if no break longer than 5 cm was observed within the IBC. The final diagnosis was made according to the Chicago classification v.3.15 Individual swallows were excluded from analysis in case of double or multiple swallows that could lead to deglutitive inhibition of peristalsis. Ambulatory pH monitoring: oesophageal ambulatory pH monitoring was performed using a dual sensor impedance/pH catheter connected to a portable digital data recorder that stored data for up to 24 hours or a wireless 48 hours Bravo pH system (Medtronic, Sunnyvale, California, USA). Positioning of the pH probe was established based on the pH difference between the distal (gastric) and proximal (oesophageal) sensors and previous lower oesophageal sphincter identification by HRM or directly, on demarcation of the esophago-gastric junction (EGJ) during endoscopy. Patients were instructed to carry out normal daily activities without dietary restrictions during the study. The pH data were analysed using standard software. The pH test was considered abnormal when total oesophageal pH <4 was over 4.2% of the time.16 In the patients who underwent wireless pH monitoring, the data from the day with the worse pH profile was used. Statistics: Statistical analysis was performed using commercial statistical software (Minitab Express). The two-tailed t-test was used to compare continuous variables. For all statistical analyses, the level of significance was set at p<0.05. Results are depicted as tables, bar graphs and box plots, as needed. Figure 1 outlines the study flow. 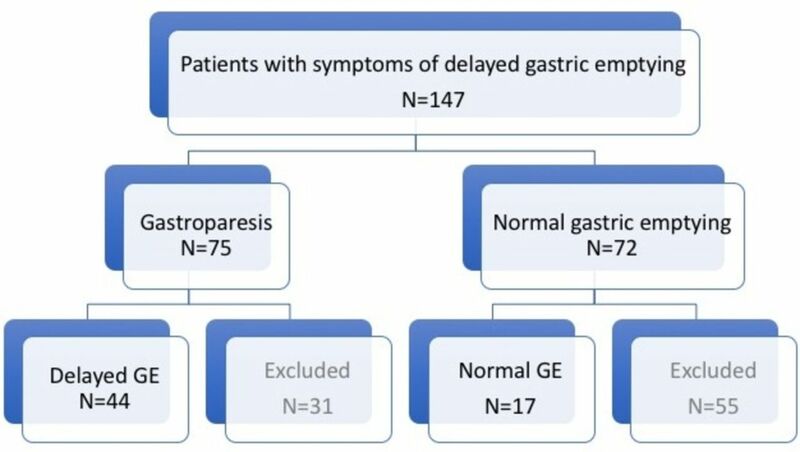 Of the 147 patients with epigastric pain and symptoms suggestive of delayed gastric emptying (GE) who underwent evaluation, 75 had scintigraphic evidence of gastroparesis (delayed GE), whereas 72 had normal studies (normal GE). Of the former group, 44 patients also underwent HRM and pH monitoring and thus comprised the study cohort (delayed GE). Of the latter group, 17 underwent HRM and pH monitoring and were used as symptomatic controls (normal GE). In total, 86 patients were excluded because they had incomplete HRM and pH data. Table 1 shows the patient characteristics of the two study cohorts. Most patients were middle-aged women, with mild to moderate idiopathic gastroparesis and normal endoscopy. Figure 2 displays the symptom prevalence in the two groups: epigastric pain, regurgitation, postprandial bloating and belching were the leading symptoms in both groups. Weight loss was significantly more prevalent in the group with delayed GE (p<0.002). Figure 3 depicts the range and severity of symptoms in the two groups. Symptomatically, the groups were similar except that those with normal GE did not exhibit the degree of weight loss seen in patients with delayed GE (p<0.002). Forty-three per cent of patients in the delayed GE group had abnormal oesophageal acid exposure which was not significantly different compared with 38% of patients with normal GE. The delayed GE group had a mean %pH <4.0 of 7.5 (SEM 1.4), as compared with the normal GE group that had a mean %pH <4.0 of 5.4 (SEM 1.7) (NS) (table 1). There were no age, BMI, or gender differences. Both groups were endoscopically similar (table 1). Symptom prevalence (for epigastric pain, heartburn/regurgitation, bloating, nausea, vomiting, belching, dysphagia and weight loss) in the two groups (those with delayed GE (blue bars) and those with normal GE (orange bars)). Except for weight loss, both groups exhibited similar prevalence of upper digestive symptoms. GE, gastric emptying; Hb/Reg, heartburn/regurgitation; WtLoss, weight loss. Range and severity of symptoms (for epigastric pain, heartburn/regurgitation, bloating, nausea, vomiting, belching, dysphagia and weight loss) in the two groups (those with delayed GE (blue bars) and those with normal GE (orange bars)). Except for weight loss, both groups exhibited similar range and severity of upper digestive symptoms. GE, gastric emptying; Hb/Reg, heartburn/regurgitation; WtLoss, weight loss. Figure 4 depicts the HRM findings in the two groups, using the Chicago classification (v.3). Sixty-eight per cent of patients with gastroparesis exhibited a range of oesophageal motility abnormalities (ie, EGJ outflow obstruction, achalasia, diffuse oesophageal spasm and ineffective oesophageal motility or combinations). In comparison, 42% of the normal GE group had motility abnormalities, numerically but not statistically significantly different. There was no relationship between oesophageal symptoms and motor or pH abnormalities in either groups (data not shown). 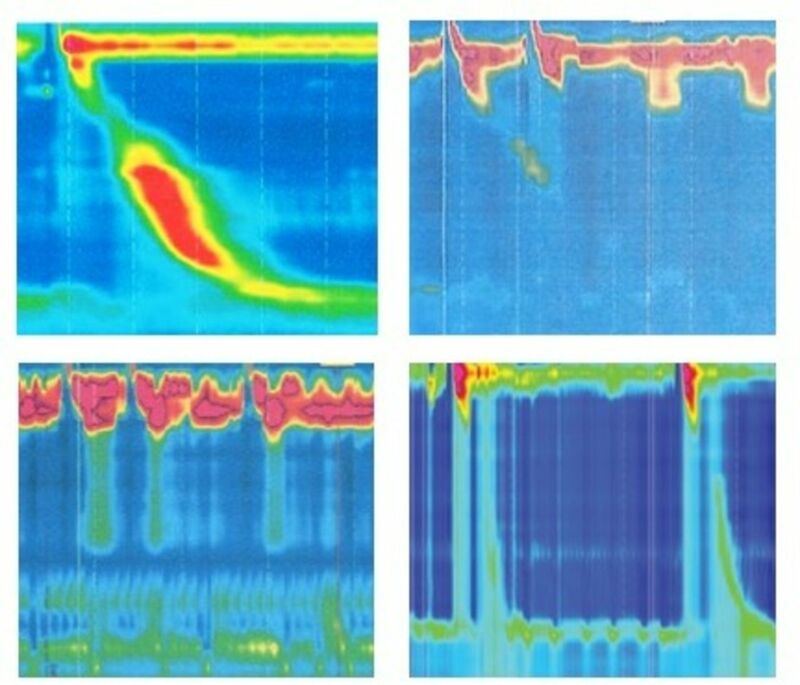 Figure 5 displays the range of HRM findings seen in this study. 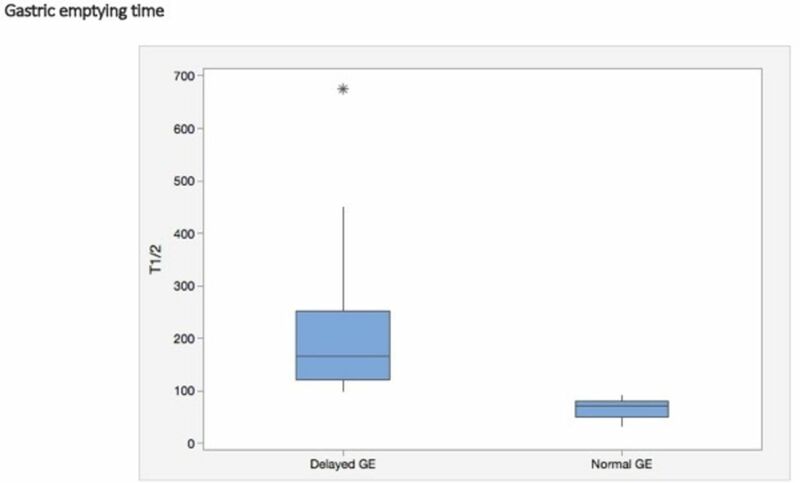 Figure 6 shows the magnitude (T½ in minutes) of gastric emptying delay in the patients with delayed GE who had a median time of 167 min (95% CI 131 to 193) versus that in the group with normal GE who had a median time of 71 min (95% CI 51 to 80) (p<0.001). HRM findings in the two groups (those with delayed GE (blue bars) and those with normal GE (orange bars)), using the Chicago classification (v.3) (see the Patients and methods section). Both groups exhibited a high prevalence of oesophageal motility abnormalities, such as EGJOO, achalasia, DES and IEM. DES, diffuse oesophageal spasm; EGJOO, esophago-gastric junction outflow obstruction; GE, gastric emptying; IEM, ineffective oesophageal motility. Representative HRM tracings. (Top panel) Left, normal oesophageal motility; right, ineffective oesophageal motility. (Bottom panel) Left, achalasia; right, diffuse oesophageal spasm. Box plot depicting the magnitude (T½ in minutes) of GE delay in the patients with delayed GE (gastroparesis, n=44) versus those with normal GE (n=17), representing minimum and maximum values (vertical lines), first and third quartiles (boxes) and median value (horizontal lines). Asterisk represents the outlier value. GE, gastric emptying. In this cohort study of patients with FD and symptoms suggestive of GP, we found a high prevalence of oesophageal motility abnormalities and pathological acid reflux, irrespective of the underlying presence of delayed gastric emptying by scintigraphy. As compared with those with normal gastric emptying, patients with GP exhibited similar upper gastrointestinal symptoms, although with more weight loss. These findings suggest that, irrespective of gastric emptying delay, such patients have a high prevalence of oesophageal dysmotility and pathological oesophageal acid exposure that may contribute to their symptoms that may require therapy and possibly account for the poor response to stomach-directed therapy. These findings also support the hypothesis that patients with FD and GP may not be distinguishable based on symptoms alone, if scintigraphy were considered the gold standard. Patients with GP may complain of various dyspeptic symptoms, such as postprandial fullness, early satiety, nausea, vomiting, bloating, belching, acid regurgitation and epigastric pain. Unfortunately, these symptoms are non-specific and indistinguishable from those encountered in patients with FD and sometimes GERD. Functional dyspepsia is a larger clinical entity comprised of patients with common symptoms, but multiple disparate aetiologies; however, data suggest that 30% of patients with FD have delayed gastric emptying, if appropriately tested.17 18 However, delayed gastric emptying may not be the sole mechanism responsible for the pathogenesis of symptoms. Several studies have demonstrated visceral hypersensitivity in patients with functional dyspepsia that occurs independently of delayed gastric emptying.19 20 In a study of patients with FD, 37.4% had hypersensitivity to gastric distension, and hypersensitive patients reported higher PDS, EPS and cumulative symptom scores.21 In our study, using the Rome IV, 84% of the abnormal GE cohort and 76% of the normal GE cohort would be classified as FD, with significant overlap. By Rome IV, EPS was seen in 59% vs 47%, and PDS in 62% vs 53% of patients with abnormal and normal GE, respectively. Since our intent was to include data from all patients referred for GET, patients with prior fundoplication or diabetes were not excluded. Most patients who met the Rome criteria for FD also met the criteria for PDS subtype; EPS subtype was also common in our patient cohorts. Idiopathic gastroparesis was the most common form of gastroparesis, whereas diabetes mellitus was the most frequently recognised systemic disease.22 23 Fundoplication is one of the most common surgical procedures leading to reversible or permanent vagal injury. The relationship between oesophageal dysmotility or GERD and gastric disorders, such as GP and FD, remains unclear and will require further study. A recent study tried to determine whether an increased number and duration of non-acid reflux events—as measured using the multichannel intraluminal impedance pH (MII-pH)—were linked to GP and found no association between GP and more frequent episodes of non-acid reflux.8 In contrast, a different study comparing MII-pH measures in patients with and without delayed GE found that patients with delayed GE were more likely to have increased total weakly acidic reflux and prolonged bolus clearance time but similar %pH <4.24 Forty-three per cent of our patients with delayed GE had abnormal oesophageal acid exposure compared with 38% of our patients with normal GE, and both groups had similar magnitude of pathological acid reflux (table 1). Oesophagitis was not statistically different between the two groups, and it could have been emetogenic in nature. Achalasia, diffuse oesophageal spasm and ineffective oesophageal motility were numerically more prevalent in the GP cohort; of the three patients with achalasia, one had previously undergone Heller myotomy, the other botulinum toxin injection of the EGJ, while the third had features of chronic intestinal pseudo-obstruction. The prevalence of diffuse oesophageal spasm (DES) was higher than expected in our cohorts, but we used the Chicago classification v.3, that defines DES as >20% contractions as premature (with distal latency <4.5 s). We also grouped jackhammer oesophagus (>20% contractions with Distal Contractile Integral (DCI) >8000 mm Hg.s.cm in this category. Only 3/12 patients with DES in the delayed GE and both with DES in the normal GE patients had dysphagia. Patients with ineffective oesophageal motility from either group had similar prevalence and severity of heartburn and regurgitation as those without. Hence, the clinical significance of these motility and pH abnormalities in patients with GP and FD is uncertain. There are several strengths and limitations in our study. Although a cohort and observational in nature, our study involved many patients presenting with symptoms suggestive of delaying gastric emptying who were studied in detail and raises the possibility of a link between oesophageal and gastric motor dysfunction. The study population was community-based, referred for evaluation and therapy and mostly suffered by moderate to severe symptoms of PDS or EPS. As in other studies, we found no difference in symptom range or pattern between those with normal and with delayed gastric emptying, and symptom pattern could not predict the presence of gastric delay. Further, no correlation between gastric emptying rate and pain ratings was found, as in other studies.25 Although many of our patients had acid regurgitation and dysphagia, these symptoms were not predominating the clinical presentation, and they could account for the diagnosis of GERD in some. No patients fulfilled the Rome III criteria of irritable bowel syndrome. Some limitations need to be kept in mind. First, owing to the nature of our referral population, Gastric Emptying Scan (GES) was determined by local standards where the patient was originally tested, and scintigraphy was not standardised using the 4-hour recording period. Second, only pH-metry was used; therefore, neither full-column reflux nor non-acid reflux was measured. Third, our population was not assessed using elaborate and well-validated GP questionnaires but instead, through our simpler, general and practical tool previously validated and used in many previous studies in our practice setting.9 26 27 Finally, it is possible that the patients who underwent oesophageal motor and pH testing represented a select group of patients with GP and FD with higher prevalence and severity of oesophageal symptoms that justified the performance of the oesophageal functional studies, resulting in overestimation of our results. A prospective study would be important to clarify this issue and eliminate selection bias. Nevertheless, our findings are intriguing and imply that a dominant functional motor disorder, such as gastroparesis, may have significant underlying overlap with both major and minor oesophageal motor disorders as well as GERD, and unless these are further characterised and treated concomitantly, a maximal therapeutic gain may not be accomplished. Such overlap is known to occur in intrinsic neuropathic and myopathic disorders associated with autonomic dysfunction, such as Parkinson’s disease, where patients may be found to suffer from oesophageal, gastric, small intestinal and colonic dysmotility with variable symptom expression and may need combination therapies, such as prokinetics, laxatives and/or botulinum toxin injection.26 27 Moreover, gastroparesis has been shown in several studies to correlate with regional dysmotility involving the small and large bowel, implying a global process not limited to the stomach in isolation.28 29 While the oesophagus is often clinically conceptualised as a discrete gut compartment, it is reasonable to think that systemic or regional dysmotility may also have profound oesophageal manifestations that could contribute to clinical symptoms. Given the retrospective nature of this study, we cannot reliably assess the efficacy of such multidimensional therapy or the degree that it was implemented in our cohorts. Prospective studies will need to be designed to address these important clinical issues. In summary, this retrospective cohort study suggests that, irrespective of gastric emptying time, patients with symptoms suggestive of gastric neuromuscular dysfunction, GP and FD, have a high prevalence of oesophageal dysmotility and pathological oesophageal acid exposure that may contribute to their symptoms and may require therapy .
. Stanghellini V: functional gastroduodenal disorders. Gastroenterology 2006;130:1466–79.
. Gastric emptying in patients with gastroesophageal reflux. Gastroenterology 1981;80:285–91.
. Practice parameters Committee of the American College of Gastroenterology. ACG practice guidelines: esophageal reflux testing. Am. J. Gastroenterol 2007;102:668–85.
. Prevalence of gastrointestinal symptoms associated with diabetes mellitus: a population-based survey of 15,000 adults. Arch Intern Med 2001;161:1989–96.